Experiencing the work of Monika Weiss involves all your senses to some degree. 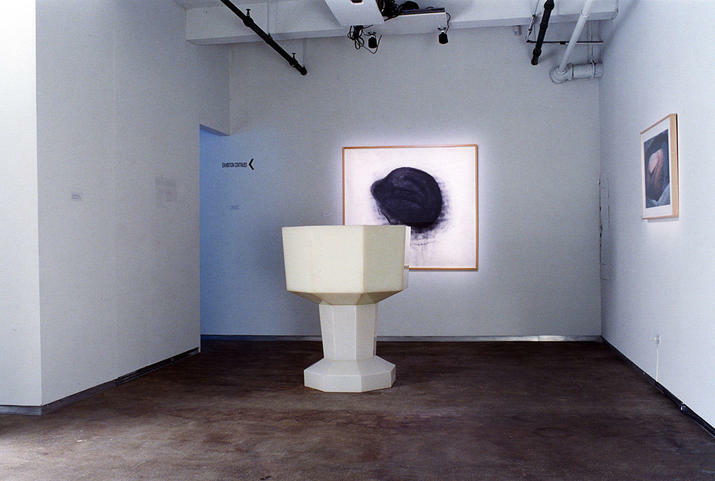 One can not simply walk past the Skulenie (2003), an enigmatic charcoal drawing on photographic backdrop paper, without feeling the essence of the artist's presence, or hearing the echoes of physical form resonating in Weiss' drawings, sculpture installations, live or video projected performative works. The exhibition embodied the exploration of time and physical endurance in a subtle and even tranquil camouflage of opaque colors and layered sounds. There is just the right amount of contractions and ambiguities in the exhibition, to present a new visual experience with every gaze. Playing with time in such a way makes, Drawing the City, (Day One, Day Two) 2004 and Lethe 2004, timeless, venerable, and universally recognizable. The artist body is a recurring image and material, whether live or in representation. Weiss' live body is exposed to the site-specific conditions of time and climate, while also performing a documentative function. Weiss invites the public to draw within the large-scale landscapes, blurring the boundaries between herself and others. In some of Weiss' sculptural and sound installations a solo performative action invites the public's voyeurism while creating a site that embraces their own bodies as they share the task of remaining silent in front of her solitary action. 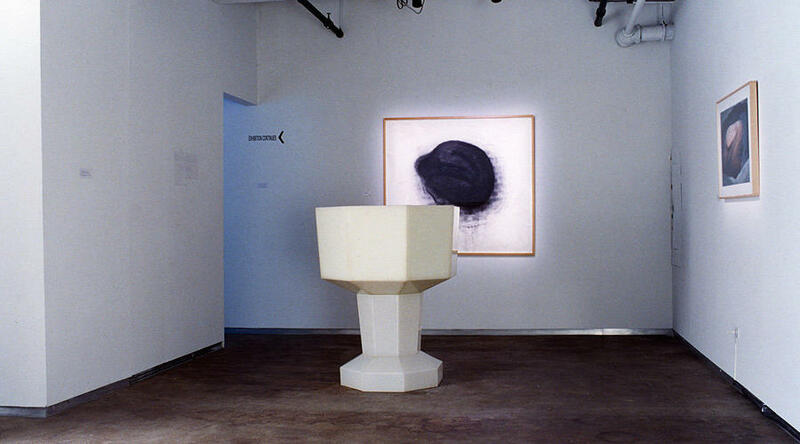 In White Chalice (Ennoia) 2004, a video image of the artist's curled up body is projected into the water-filled octagonal chalice, becomes subtly yet increasingly interactive, as one may not only see themselves within the reflection, but also experience the virtual figure looking back at them. This opens up a dialogue between real time performance and the suggestion of time past, creating delicate layers of time and meaning. Sculpted cast-concrete vessel filled with hundreds of layers of paper "Lethe" on the other hand, may be viewed with or without the live or prerecorded presence of the artist. The evidence of a past performance is still palpable through the line traces of her body, another play on time and perspective. Lethe may also function with the sensors and motors creating a 'breathing' rhythm based on a fragment of music by Hildegard of Bingen, (which we hear in the Drawing the City) and which Weiss described as, "the abstract and physical line in the composition, in the room." 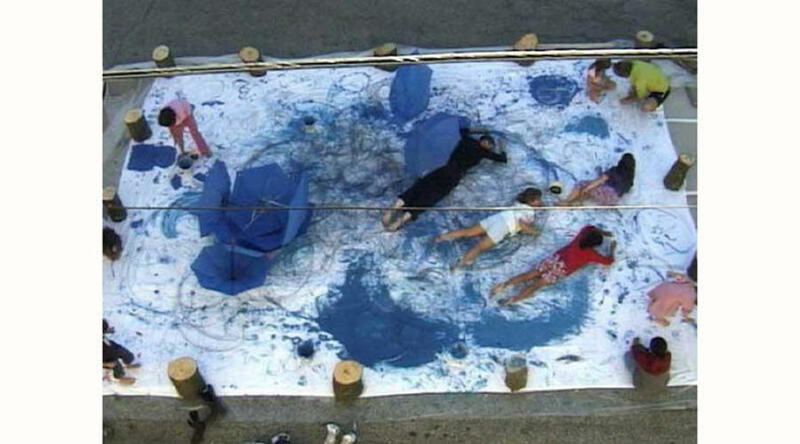 In all of her recent works Weiss surrenders herself to the self-imposed environment, both in space and in time, where the time itself becomes conquered as merely an equal element together with her body, the site, the paper, the paint, the stone, the wind, the umbrellas and the passing pedestrians. The exhibition "Monika Weiss: Intervals" together with Carolee Schneemann's "Infinite Kisses II and SNAFU" was on view at Remy Toledo Gallery, New York, October 21 - November 20, 2004; 529 West 20th Street, New York, NY 10001.